e-commerce has always been a sector close to my heart, and when I heard of this book, I knew instantly that I had to read it. This book is a detailed coverage of Amazon and is an unflinching outsider’s view to the same. 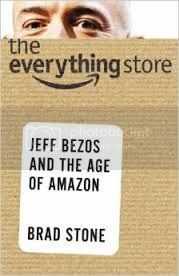 The author Brad Stone has done a wonderful job in creating a well rounded story of how Amazon has become, what it is today. Amazon is very well on its way for dominance on everything we buy. The recent launch of its phone is one more hint in that direction. Initially, it started off as a bookseller, but it was always designed for bigger things. Jeff Bezos, it’s founder, always seemed to have this grand plan of making it “The Everything Store”, which enables people to buy literally anything sold on the planet, and beyond. Being featured Recently on the front page of The Economist newspaper shows its ever growing popularity and its ability to stay relevant. One very important lesson to learn from Amazon is its relentless focus on Customer Service. (Interesting piece of nugget: Jeff was initially contemplating naming his company relentless.com and had even registered the name, but I guess better aesthetic sense prevailed). The author talks about Jeff’s exceptional drive and obsession and his journey in providing the best possible experience to his consumers. Customer first, is reflected throughout the book. The book also gives a very deep look into the behavior of its rather eccentric founder, Jeff Bezos. How he managed pressures, and cynics who have multiple times written him and his company off. Every time that Amazon’s obituary is talked about, it pulls out the proverbial magical rat from its hat. Any biography of a business leader is tough. Especially if it about a person who is still very much in his prime, and more so if it is about a company that is still growing ahead of the industry. An industry that it has created. Also, the author not being the founder, or an ex-employee makes it more difficult, but Brad has done a remarkable job. It shows the amount of research gone into the book. Brad tries to make it a parallel running between Amazon’s illustrious run so far, and a semi-biogrpahical account of its inspiring founder. That I think is a big weak point of the book, for readers like me who expected it be a story of Amazon.com and not its founder. The hard plastic case comes enclosed in a disposable surgical-type outer wrap.